NEW YORK (CNNMoney) -- In the span of a few years, Libya's financial tendrils have reached across oceans, across borders and across continents. The United States, the United Kingdom, Switzerland and the European Union recently moved to freeze billions of dollars of assets belonging to Libya's government and its leader Moammar Gadhafi and his family, as the violence and chaos spread across the country. Libya shares little about its financial dealings, but there are some things we do know about the types of assets that were frozen and where Libya has invested its oil-rich wealth. Through various financial institutions, Libya has spread its wealth across at least 35 nations on four continents. The country owns a bizarre mix of investments, ranging from luxury real estate and publishing companies in Britain, to hotels in the Middle East, to a small stake in Italy's Juventus football franchise. Libya has also invested hundreds of millions of dollars in poor and, in some cases, unstable African nations. The Libyan Foreign Bank even owns a stake in the Commercial Bank of Zimbabwe. All of that comes on top of the billions of dollars that Libya has socked away in the United States' largest and most influential investment banks. "Libya is just getting used to the fact they have a lot of cash on hand to invest," said Ashby Monk, a research with Oxford University who specializes in sovereign wealth. Libya has always had large amounts of cash to throw around because of its massive reserves of high-quality crude oil. But when the United Nations lifted its economic sanctions in 2003, Libya created its own $60 billion sovereign wealth fund. Today, the Libyan Investment Authority ranks among the world's largest sovereign wealth funds. The country also uses the Libyan Central Bank and the Libyan Foreign Bank as channels to invest as well, primarily focusing on domestic and African investments. Here's what CNNMoney was able to glean through public documents, sources familiar with Libya's investments and documents made public by WikiLeaks. North America: The Libyan Investment Authority used the U.S. financial system to take stakes in mostly low-risk, short-term securities and cash equivalents. Mohamed Layas, the head of the LIA, told U.S. authorities in January 2010 that the country had "about $32 billion in liquidity" stored in U.S. banks at the time, according to a WikiLeaks cable. That's roughly equivalent to the amount the U.S. Treasury Department had frozen earlier this week. Also in January 2010, Layas said, Libya divvied up that $32 billion into chunks of $300 million to $500 million, currently managed by dozens of banks across the United States. Libya even invested more than $300 million into the now defunct investment bank Lehman Brothers, according to U.S. bankruptcy court filings. The country is fighting in the courts to recover those losses. 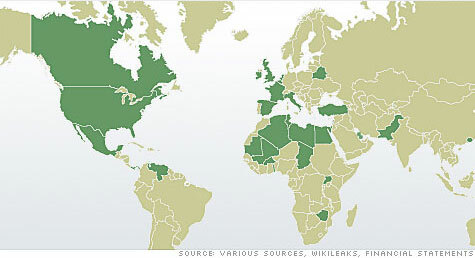 In Canada, Libya made one of its first private-equity deals by purchasing Verenex Energy for about $320 million in 2009. The deal was notable because Verenex was one of the first publicly-traded companies to drill for oil in Libya after the U.N. sanctions were lifted. Europe and the U.K.: Libya put the bulk of its cash to work in Europe and the United Kingdom, partly because of its geographic proximity. The executive director of the Libyan Investment Authority also said it has a preference for investing in the U.K. because of its "uncomplicated tax system," according to a WikiLeaks cable. In Italy, Libya's former colonial master, the LIA has stakes in Italian corporate names like oil giant Eni, defense contractor Finmeccanica and UniCredit, Italy's largest bank. The LIA also has a 7.5% stake in Juventus. In Britain, the LIA owns a 3.3% stake in Pearson, the owner of the Financial Times and Penguin Publishing. The fund also has stakes in several U.K. commercial real estate properties. Libya also owns a portfolio of oil-related assets in Europe through the LIA, consisting of three oil refineries and approximately 3,000 gas stations across the continent, according to a 2008 speech given by Layas in London. Since the violence broke out in Libya, Pearson froze Libya's stake and dividend until further notice and Juventus said it was monitoring developments in the North African nation. Africa: Through dozens of small investment banks scattered across Africa, Libya has taken stakes in dozens of small African telecom and infrastructure companies, some located in unstable nations such as Uganda and Zimbabwe. The investments in Africa play two roles, analysts said. Because Africa has struggled for years to get investors, Libya has become a key source of capital on the continent. Secondly, the investments in Africa have helped support Gadhafi's long-time image of being the "father" of Africa. "Gadhafi is providing support where there is none," said Michael Maduell president of the Sovereign Wealth Fund Institute. -- CNN supervising producer Adam Levine contributed to this report.